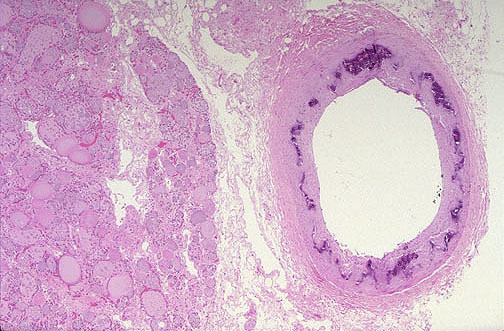 Monckeberg's medial calcific sclerosis is seen in this artery to the right of thyroid tissue. Another view appears below. This finding occurs most often in the elderly and does not typically have serious pathologic consequences because the arterial lumen is not compromised. Small muscular arteries in the pelvis, neck, and breast regions can be affected. Medial calcific sclerosis can also be seen involving the extremities in association with autonomic neuropathy in diabetes mellitus. The calcified arteries may be visualized on radiographs, and you need to know what is represented. Calcium deposits collect in the media of muscular arteries.